In pioneer times hotels on major road and rail routes let weary travellers break their journeys. But many hotels were merely drinking institutions where men imbibed as much as they could. Later, increasing numbers of cars and the boom in international tourism added new accommodation choices. 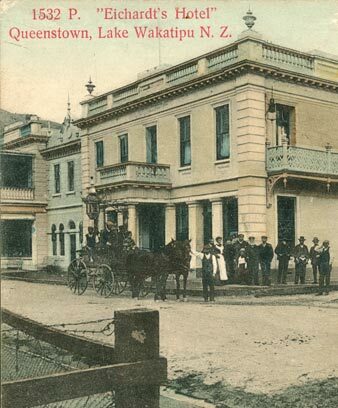 The first New Zealand hotels were built in European settlements and along travelling routes between them. Travellers rode on horses or carriages, and hotels marked the end of a day’s journey. Hotels almost always sold alcohol, and many public hotels were just ‘pubs’ where men met to drink. Some were very basic. The earliest hotels were in Northland. As roads were built and railways were developed, hotels appeared in towns throughout the country. They were usually small two-storey wooden buildings, with a bar and a place to dine downstairs, and bedrooms and bathrooms upstairs. As towns grew into cities some larger grand hotels were built. Public bars were richly decorated and there were rooms for smoking, reading or playing billiards. During the gold rushes fancy hotels sprang up in towns near the goldfields. Men enjoyed meeting their mates to drink and smoke in hotels. Laws were made so that bar owners had to provide hotel beds. This meant that most hotels came to be owned by the big breweries. They were mainly places to drink rather than places to stay. After 1990 bar owners no longer had to provide beds. From the 1950s motels – motor hotels – were built. These became the most popular option for travellers – they could save money, park right outside and make their own meals. The government built and ran some hotels to attract tourists. But the big boom in overseas tourists didn’t happen till the late 20th century. In the 2000s many budget tourists stay in backpackers hostels – sometimes former hotels. Some international hotel chains have built multi-storey hotels, and some historic hotels survive.